"In December of 1909 Professor William Day came to view the Bradford Marsh for the first time. He would return again and again until finally it became his passion. He was the one person who was there leading the project for the beginning to its completion in 1930. While this book records the events of the reclamation project it is also the story of the enthusiastic and infectious leadership of one person, Professor William Day." So starts the book by George Jackson. This 127 page book is a well researched and well written record of the mammoth job of turning a 7000 acre marsh just north of Toronto, now Canada's largest metropolitan area, into productive farmland. Printed in 1998 by the Bradford Print Shoppe, 170 Artesian Industrial Parkway, Bradford, Ontario, this is a fascinating true tale of people who accomplished a dream. Although it does give much credit to Professor Day, many visionaries, landowners, local politicians and employees of the project are also introduced. William Henry Day and his wife Ethel Emily (Williams) Day produced two girls and two boys. 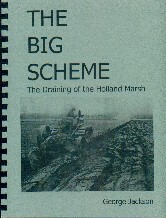 Following the completion of The Big Scheme, the younger three lived in Bradford at various times and helped their father and mother with the development of the market garden. Their eldest, Estella Marjorie ('07) had started high school in Guelph but matriculated in Bradford before attending Normal School and later McGill. 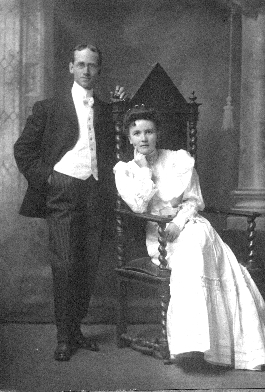 The two pictures of Bill and Ethel were taken by R. B. Kennedy in Guelph, Ontario, prior to 1909. 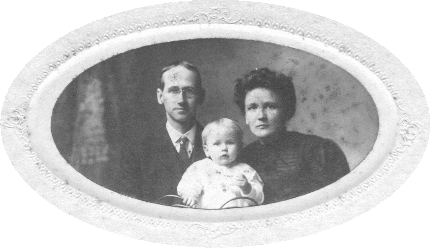 'Stella, the baby in one, moved to New Brunswick when she married lawyer Earl Thomas Caughey in 1934. Professor Day's proclivity towards teaching, science and business are reflected in all branches of the family. 'Stella's line has produced several teachers, engineers, computer scientists, a medical doctor and an archaeologist. Her progeny have started a number of small businesses, mostly successful. A few of us design and/or host web pages as a hobby. Links to some of our creations can be seen on the Washburn Home Page. All members of the Day clan are very grateful to George Jackson for producing this book. "Granddad Day" saw only two of his ten grandchildren before he died in 1938. The Big Scheme fills a very important gap in our family history. For more information on Professor Day go to the Professional Engineers of Ontario tribute to him which states: Day's research was always directed to the betterment of Ontario agriculture, and some of his contributions are conferring great benefits on the province down to the present time.